FaithWeb: "Whoever Is Not Against Us...."
"Whoever Is Not Against Us...."
In a recent conversation, a friend of mine mentioned his frustration with the Churches of Christ. He’s been reading authors from outside our churches, and he’s feeling that we’ve been a bit too exclusive in regards to Christians from other fellowships. He’s realizing that though we’ve often been certain we were right and they were wrong, in reality we haven’t always been right, and they haven’t always been wrong. Historically, the only way we could be honest with ourselves about our reason for being was to say that we were all about Christian unity in Scripture alone. There was no other valid reason (in our own world view) for us to exist. That was a smokescreen, of course: other fellowships were always going to be found wanting, because we stacked the deck by making our own interpretation of Scripture - and not Scripture alone - the standard. And we honestly never considered the fact that other fellowships and denominations were trying to find their authority in Scripture as well. It’s this historic exclusivity that’s bothering my friend. And maybe that’s nothing that you’ve ever experienced in Churches of Christ. If so, that’s good; in some ways your experience bears out the response I had for him. But I’m sure that some of us know exactly what he’s talking about. We’ve had our own experiences and frustrations with that same exclusivity. That impulse toward exclusivity has always been there, I guess, even from the days when Jesus was here on earth. John sounds like one of our own preachers, thundering against someone who dared to drive out a demon using Jesus’ name without being part of the right group. “But don’t worry, Jesus. We told him to stop,” John said. Because, you know, it’s dangerous to have unauthorized believers running around helter-skelter, doing things in Jesus’ name. Jesus must have stunned John when he said, “Don’t stop him! He’s on our side, if he’s not against us!” It came down to that, for Jesus. Someone casting out demons in his name was just one more witness to the power of God over the darkness. I told my friend that I think things in Churches of Christ are changing. Having been closely acquainted with teenagers and young adults in recent years, it seems to me that the upcoming generation in our churches has absolutely no interest in fighting the “we’re right, you’re wrong” battles of earlier times. By and large, when they meet a Christian from another fellowship they recognize family. They understand that believers can disagree with one another without having to question one another’s standing before God. It’s not that they don’t think that disagreements matter, or that they don’t know what they believe and why they believe it; it’s that they understand that what we have in common with other Christians in Christ and the Holy Spirit matters more. Most encouraging to me is that many of our churches have changed their focus. They’ve left behind an attitude of alienation from the world and from other Christian fellowships. That doesn’t mean that they’ve bought in to the values of the world, or compromised any of their convictions. Instead of focusing on how they’re right, and how other fellowships are wrong, they’re lifting up Jesus in word and action. Instead of swelling by stealing sheep from other pens, they’re growing by connecting with unchurched people and introducing them to Jesus. I've never seen such a narrow focus on Jesus in our churches. We read Paul through Jesus and the rest of the Bible now, and not the other way around. As America becomes more "post-Christian," we've become more likely to see other believers as allies, and not enemies. In the last twenty years or so, the Holy Spirit has begun opening our minds. In the process, we haven’t lost anything that’s central to the gospel. In fact, we’ve been freed up to emphasize the gospel. To be sure, the exclusivist mindset that frustrates my friend endures here and there among us. But those who preserve it are now a minority - a vocal one, but a minority all the same. Their voices, once the mainstream, are now marginalized. The flattening of doctrine that made every issue, every opinion, every interpretation of every text as central to the faith as the resurrection of Jesus is slowly draining away. Our people are leaving it behind even now. It will be gone within the next generation. It's not a liberal or conservative thing; those words mean nothing, or more precisely they mean whatever we want them to mean. They only serve to divide, to create alliances and conflicts out of thin air. It's not about whether we should accept every innovation or new direction, or reject everything older than 5 years ago. (Or vice-versa.) It’s a change that runs much deeper than that, a sea change that goes even to what we mean when we say that the Bible is our authority. I told my friend that I have a lot of hope for the future of Churches of Christ. I believe that many of the teachings and practices that have characterized us will remain, because they’re good, biblical teachings and practices. I believe that many things will change, as well, as we learn to prioritize maintaining “the unity of the Spirit in the bond of peace” and recognize that disagreement, either internally or with Christians from other fellowships, doesn’t have to mean outright division. The church my son inherits may not look a lot like what I grew up with, but I'm optimistic that it will be more attuned to joining in the work of God in the world. Where do you draw the line, Patrick? Paul has made it abundantly clear that we are not to rub shoulders with those who preach any other gospel other than the one he preached (Gal. 1:8-9). Are you suggesting that Paul didn't know what he was talking about? Are you suggesting that we fellowship with those who do not believe in baptism (immersion) for salvation? Musical instruments are acceptable in worship? How about women elders, deacons? 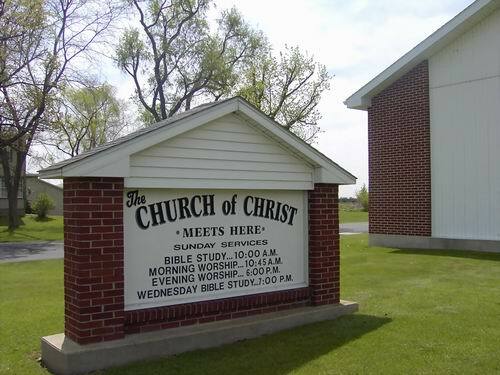 This is why the Church of Christ has become so divided . . . because well-intentioned church leaders such as yourself become enamored by the things of the world and start deviating from the pure teachings of God's word. Just because it "feels good and right" doesn't make it right. Actually, I think you'd have to say that Churches of Christ have been divided almost from the first. You touch on some of the reasons in your post. First, there's the misidentification of the gospel. The gospel has nothing to do with whether or not musical instruments are acceptable, what roles women have in the church, or even about whether or not we "fellowship with" unbaptized believers. (Matthew 24:14, Romans 1:16-17, Romans 16:25, Colossians 1:21-23) According to Paul, the gospel has to do with the death, burial, and resurrection of Christ (1 Corinthians 15:1-8). It displays Christ's glory (2 Corinthians 4:3-4). In Galatians, the "other gospel" about which Paul is concerned directly contradicts his proclamation of justification through faith in Jesus by pressing Gentiles to keep certain tenets of the Law of Moses. So, yes, I certainly believe Paul knew what he was talking about. That's another reason for the division in Churches of Christ: our willingness to instantly jump from disagreement to branding those we disagree with. Based on my relatively short post, you accuse me of undermining Paul and being enamored with the things of the world. (Thanks at least for calling me well-intentioned!) I suppose all that could be true, but isn't it just as likely that I'm a brother who sees things differently than you do? I would respectfully suggest that you've twisted Galatians 1:8-9 in order to have a convenient "biblical" category in which to pigeonhole and dismiss me. That's where division comes from. So, to answer your initial question, I think I'll draw the line where Jesus and Paul did: with the gospel. Short of a compromise of the gospel, I may have disagreement but will not draw lines of division. Enjoyed this post tremendously, and upon finishing it, I found myself nodding in the affirmative while simultaneously shaking my head in disagreement. I agree with you that we should definitely recognize the communal striving for a relationship with Christ that other congregations have, but I have to disagree that we minister to them as well. How can we in good faith, proclaim to none believers that the way to Christ is through; hearing the Word, believing, repenting and being immersed; then turn around and say that other heritages that don't practice adult immersion are right too? Yet I must ask Pinochos, how can we claim to be working toward building a unity in faith with our fellow Restoration movement brothers in the Independent Christian Churches, when the only disagreement we have is over something that isn't in the Bible one way or the other. It seems a case of the plank and the speck to me. So where is our balance, where is the line so to speak? I think it comes down to something Christians today are having a lot of difficulty dealing with, obedience. I've always likened my relationship with Christ as the relationship I had with my father when I was a about 17-21. My father and I by this time had become close, the years of hormone fueled fighting had ended and I had come to appreciate, love and respect my father and all that he provided for me. I could go to my earthly father (as I do now with my Heavenly) father with anything I was troubled with. I could talk to him personally, ask him for guidance, for assistance or thank him for his love and gifts. Yet, despite the close relationship I had with my father, the open-line of communication I had with him, I still understood that my father was to be obeyed when he issued a command, regardless of whether I agreed or understood it fully. My father asked me to consider the young men who I ran around with, and ask myself if they were boys who were obedient to their fathers. If they weren't he encouraged me to avoid being placed in situations with them when he was not present. The key is to "rub shoulders" with our prodigal brothers in the places where our Father is present, or in the places where we agree with them on what Christianity truly is, such as taking care of the poor, ministering to the ill, praying for the sick, but we should avoid them where Father is not present, when they are evangelizing with their non-scriptural traditions, when they are blatantly disobeying the Word (Women Elders) and we should, as good brothers, and faithful sons, remind them of Father's instructions with the hope that they will return fully to our Father's home. On the other hand, people I know who are serious about their walk with the Lord generally do their dead-level best to obey him. And, yet, sometimes we still disagree about how best to do that. Paul seems to recognize this phenomenon in Romans 14 and 15, and finally says that there may be times when we'll just have to be content that brothers on both sides of an issue are honestly trying to please the Lord. We'll have to affirm that "the kingdom of God is not about" such things, and affirm the things it clearly IS about, and stop passing judgment on one another or looking down on one another and recognize that "each of us will give an account of himself to God." In doing so, we don't have to compromise our convictions on adult immersion or whatever else. I don't think I'm being disingenuous by preaching that people should repent and be baptized (which I do each week) while accepting as my brother or sister someone who has a different understanding of the significance or role or mode of baptism. I don't believe it's disingenuous because what makes us family is our faith that we are who we are because of Jesus, and not a perfect understanding of baptism (or anything else). Frankly, I think that this attitude puts me right in the center of the biblical imperatives to love my brother, to not judge him, and to make every effort to maintain the unity of the Spirit in the bond of peace. Part of the problem may be that we don't have as solid a grasp as we need to about what is central to the gospel. In general, the gospel is about what GOD has done, is doing, and promises to do in Jesus. I get suspicious whenever we get preoccupied with the exact order and nature of our response to him. While our response matters, it is not the gospel and thus we might find (and even expect) some variation there, as people come to Jesus from all sorts of backgrounds and with all sorts of preconceptions. I find that most of us harbor some subset of doctrinal understanding that we consider essential to salvation, for reasons that are often intensely personal and entirely arbitrary. We'll give folks leeway right up until they hit our sacred doctrines, and then we turn the screws. Charismatics might insist that if I don't speak in tongues I'm not a true Christian. Catholics might draw the line at confession. Some mainline Protestants would say a lack of concern for social justice is a dead giveaway that my faith is a lie. In our fellowship, we might say adult baptism by immersion is the true doctrinal test. I'm suggesting that we simply need to resist the temptation to draw lines over anything but the gospel - who Jesus is and what he did. You yourself refer to those from other fellowships as "prodigal brothers". Yes, OK - from our perspective they are prodigal on some issues. I imagine they would call us prodigal on some issues as well - and maybe not even the same ones! In the end, though, every brother or sister in Christ I have is in error somewhere - and not always because they're just refusing to obey Scripture. Sometimes it's because they just honestly misunderstand. And if God's grace doesn't cover doctrinal errors, I'm in deep rough myself. Again, thanks for taking the time to express your thoughts. Sermon: February 20th, 2011 - "Foolish"
Sermon: January 16th, 2011- "Don't Say Recession"